At six feet, five inches, Elder Bruce R. McConkie of the Quorum of the Twelve was an impressive figure. His physical stature in some ways matched his striving for eternal truth. 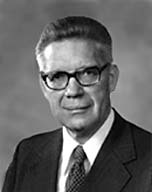 A friend and fellow member of the First Council of the Seventy, Elder S. Dilworth Young, once wrote of Elder McConkie: “He is impatient with half truth and intolerant of untruth. The way to righteousness is a clearly marked road of scriptural and revealed truth. He will have nothing else” (Ensign, Jan. 1973, p. 11). On April 19, 1985, Elder Bruce R. McConkie passed away in Salt Lake City. He was 69 years old. He had battled against cancer for more than a year, undergoing surgery for colon cancer in January 1984. He subsequently returned full-time to his apostolic duties while continuing chemotherapy treatment. His last public appearance was on April 6, when he addressed the Church’s general conference. Elder Bruce R. McConkie had served in the Quorum of the Twelve since 1972. He had also served in the First Council of the Seventy for 26 years prior to his calling to the Quorum of the Twelve. Elder McConkie was the first child born to Oscar W. McConkie and Margaret Vivian Redd. His father practiced law in Monticello, Utah, until Bruce was 12. The family then moved to Ann Arbor, Michigan, where his father studied law for a year. Even though just a deacon, Bruce taught the Book of Mormon in the family Sunday School. Following his father’s year of law study, Bruce and his four brothers and a sister returned from Ann Arbor to Salt Lake City with their parents. As youngsters they enjoyed working on the farm in Monticello every summer. Their home life encouraged Bruce to think seriously about the gospel. Mealtime conversations centered on gospel subjects. As the children grew older, their father held weekly family gatherings just to talk. At age 19, Bruce served a two-year mission in the Eastern States Mission. After returning home he attended school at the University of Utah, earning his B.A. degree, and later his juris doctor degree. It was while walking to and from school at the university that he developed a habit of study that was of great value to him. He would think of a subject in the gospel such as repentance and would then, in his mind, make up an outline for a sermon on the subject, adding the appropriate scriptures and supporting material. Doing this daily as he walked gave him practice in analysis of doctrinal subjects. This careful organization and logical progression was evident in his sermons. While at the university, he met Amelia Smith, daughter of President Joseph Fielding Smith, then a member of the Council of the Twelve. One Saturday night after attending a party at the Smith home, as it neared midnight, he excused himself and departed in time to be at his own home before Sunday. Sister Smith was much impressed by this obedience to parents and principles and told Amelia that this young man would be one to watch. Following a courtship the couple were married and had nine children, one dying as an infant. Their children still living are Vivian, Joseph, Stanford, Mary, Mark, Rebecca, Stephen, and Sara Jill. At the time of his death, Elder McConkie had 46 grandchildren and one great-grandchild. After graduation from law school, Elder McConkie was assistant city attorney in Salt Lake. He served four years in the armed forces during World War II as an intelligence officer, achieving the rank of lieutenant colonel, and upon his return became a writer on the editorial staff of the Deseret News. In 1946, at the age of 31, he was called to the First Council of the Seventy. In the council he served as serviceman’s coordinator and managing director of both stake missions and full-time missions. Elder McConkie served as president of the Australia South Mission with headquarters in Melbourne from 1961–1964. He also wrote numerous articles, poems, and handbooks. Among his published works are Mormon Doctrine, an encyclopedia-type work covering more than 1100 gospel subjects; and Doctrines of Salvation, three volumes of the doctrines expounded and explained by President Joseph Fielding Smith. He has also written Doctrinal New Testament Commentary and a multi-volumed series on the life and mission of Christ. “And now let it also be written, both on earth and in heaven, that this disciple … does himself also know of the truth of those things of which the prophets have testified. For these things have been revealed unto him by the Holy Spirit of God, and he therefore testifies that Jesus is Lord of all, the Son of God, through whose name salvation comes” (Doctrinal New Testament Commentary, 3 vols. Salt Lake City: Bookcraft, 1965–73, 1:876).